Located in the heart of Central, Hong Kong’s booming art and business area, Duddell’s offers some of the city’s best, most precise two Michelin star cuisine. The refined, austere setting consists of an elegant downstairs seating area, a more casual upstairs section (the two are joined by a travertine staircase), a member’s only library, and a 200 square foot garden terrace. Owned by Yen Wong and designed by acclaimed British designer Ilse Crawford, the spacious dining room is pale cream and earth tone colored, with tables placed at reasonable distances from each other; it’s also reasonably quiet, oozing a refined charm that the many well heeled Hong Kong regulars eating more or less silently no doubt contribute to. The Head Chef is Siu Hin Chi, previously of T’ang Court fame; those who had frequented the latter institution will recognize his touch in Duddell’s outstanding dishes. 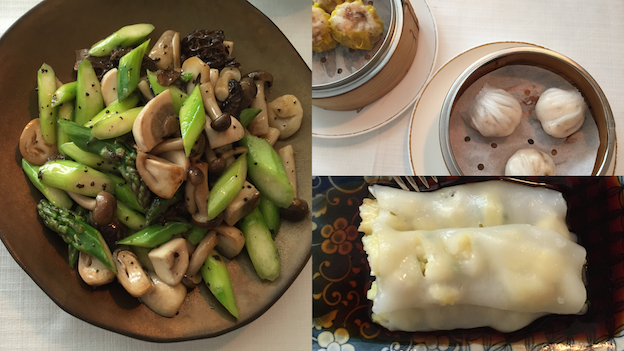 I have rarely had similarly precise, simply prepared Cantonese cuisine dishes that so resonate in flavor: and while the ingredients each sing their own tune, they end up being in harmony with the whole. The vegetarian dumpling with Matsutake mushroom is a delicate but flavorful way to start, the bean curd sheet roll, shrimp, black truffle creation airy and delightful (I could have downed nine or ten of these all by myself in a matter of seconds, and remorselessly at that), the chicken bun with ginger appropriately gummy and flavorful, and the braised bean curd with spicy sauce and the seafood rice roll with coriander are also very pure and characterized by outstanding clarity and perfume. I matched all of the above with two delicious wines. The 2013 Kilikanoon Clare Valley Riesling Mort’s Block was clean and crisp, with varietally accurate aromas and flavors plus the lime note that is so typical of Clare Valley Rieslings. Razor sharp acidity and extremely intense notes of lime and chalk dust made for a memorable drinking experience. However, as good as the wine was, it was not a great choice for Duddell’s cuisine, as it proved too austere for the nuanced, sweet and sour, savory flavors that imbue the Chef’s creations. I should have known better too: when, upon hearing my selection to start things off with, my very polite oriental guest wryly observed: “Uhm… very dry!”. He was right of course, for a little sweetness would have made this a much better match for the dishes we had chosen (a Mosel Spätlese for instance, not a bone dry Aussie example). And so I made amends with the 2007 J.J. Prum Graacher Himmelreich Auslese Goldkapsel, an outstanding Auslese of a depth and richness a notch or two above most other Ausleses. Though it lacked the complexity of a Beerenauslese, this Auslese’s laser-like acidity really lifted this wine’s very sweet, viscous honeyed stone fruit, candied citrus and crystallized ginger aromas and flavors making it a more than successful match with the food. And I’m glad to report that the acidity was such the wine didn’t prove too sweet or overcome any of our dishes. Alhough I am in Asia roughly five times a year, and get to visit Duddell’s often (at least three different times in the last year alone), I’m still not entirely sure what to make of the place. 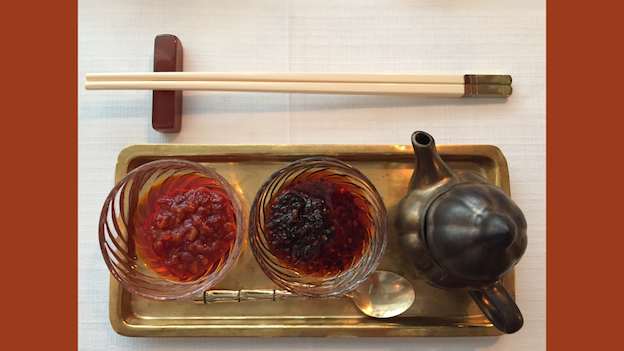 Clearly the food is stellar, of a precision and refinement in texture and use of ingredients that is uncommon elsewhere, even in other single and multi Michelin star Chinese food dining establishments you may have tried over the years. And the clientele is exceptional: all extremely well behaved men and women who know a thing or two about proper restaurant etiquette, even the small children eating at the tables are quiet and well behaved. So while the food is great and the atmosphere relaxing and pleasant for sure, the wine list is expensive, and a little hard to get excited about. The press releases read “classic hand selected wines”, but in truth, the names listed look to have been chosen to impress the eye and not the palate. Yes, there’s a vertical of Château Mouton-Rothschild and numerous top-end Burgundies, but really, are these the wines most knowledgeable wine and food lovers are looking to have with their Cantonese cuisine? In fairness, the wine list has been improved. 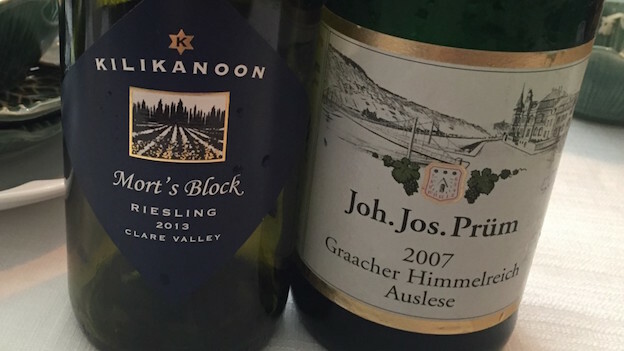 From the only three dry Alsatian and German Rieslings present on the list last fall, I counted five or six from those same regions this last February (but there’s still something like thirty different white Burgundies listed). Clearly, it’s not Chardonnay that matches best with the wonderful dishes served at Duddell’s, but perhaps it’s all just a matter of these being the sort of wines that the crowd of expense account and glitterati types want and yearn for. And if such is the case, you can’t blame Duddell’s for giving people what they want. In any case, despite a wine list that could and should be improved with a larger range of more sensible wine options, I look forward to going back to Duddell’s again and again. In fact, I can hardly wait, for the food is really that good and the setting outstanding; and if you look hard enough, you will find enough decent to excellent bottles to have made driving over to Duddell’s in the Kong’s nightmarish traffic more than worthwhile.